a Memoir of Newfoundland in the Nineties, Part 1"
Thomas Anthony Power (1882-1959): Rancher and County Judge in Oregon, USA. He was born on Bell Island February 2, 1882, the third child of Louisa (Anthony c.1844-1888) and Thomas Power (c.1838-1888), who had inherited a large farm of "several hundred acres" at The Front when his father, Thomas (c.1793-1882), died. Thomas Anthony was six years old when his parents both died in 1888, and he and his five siblings were then raised on the family farm by their Aunt Kate (Catherine Power, 1834-1910). They lived just east of what was then a Roman Catholic mission chapel, built in 1875. This was rebuilt in 1896 as St. Michael's Church. [Today, St. Michael's High School occupies the site.] There was a Roman Catholic school operating in 1878, presumably near the chapel. When he and his brothers were not at school, they were helping out on the farm. In 1897, when he was 15 years old, this third-generation Thomas Power left Bell Island for Boston, the "mecca" for many Newfoundlanders seeking their fortune at the time. His 1959 obituary states that he was educated in the grade and high schools of Boston and at Massachusetts Technical College. He was still living in Boston in 1903 when he applied for naturalization status. At some point, he struck out for the American West, and was living in Los Angeles, California and working as a telegrapher and signal maintenance manager for the Santa Fe Railroad at the taking of the 1910 Census. Shortly after that, he briefly worked on the construction of a new railroad line in Alaska. In 1911, "flush with gold pieces from his Alaska adventure, he was eager to file a claim on a quarter-section of free land" in the foothills of the Ochoco Mountains in Central Oregon. His land in Madras, Oregon was "half sagebrush and half Ponderosa Pine, and lay a few miles east of the famous Hay Creek Ranch" that had been developed by a Boston acquaintance of his. Just as his forefathers had done on Bell Island, Power raised sheep and cattle on his ranch, which he named "TP Ranch." On January 12, 1917, at the age of 35, Thomas married Evada R. Richards (1894-1969) of Tacoma, Washington, who was a summer visitor at a nearby ranch. "Never wealthy, the Powers quietly built up the TP Ranch to something beyond a subsistence-level operation and contributed indispensably to the settlement of the region. Evada helped establish the local school and was active in the historical societies. They did not have children. He served as a Commissioner of Jefferson County in the 1930s and as County Judge from 1941 until 1953." During World War II, he was chair of the USO Council in Madras, chair of the War Price Rationing Board, and chair of the Keep Oregon Green Association in his county. After having been away from Bell Island for half a century, he came home for a visit in 1947. On his return to Oregon, he wrote his childhood memories. They were edited by his wife and were published in the Redmond, Oregon Spokesman between March and June 1949. (In 1989, Jarold Ramsey, a professor of English at the University of Rochester and former neighbour of the Powers, submitted the memoir to the Newfoundland Quarterly, which published it in two parts in 1989-90.) The Powers moved from Madras to Prineville, Oregon in 1957. Thomas suffered a stroke on his 77th birthday and died two days later on February 4, 1959. Evada died there on July 19, 1969. They are buried at Mt. Jefferson Memorial Park Cemetery. You can read more about some of the earliest recorded members of the Power family on Bell Island on the "People" page in the top menu. 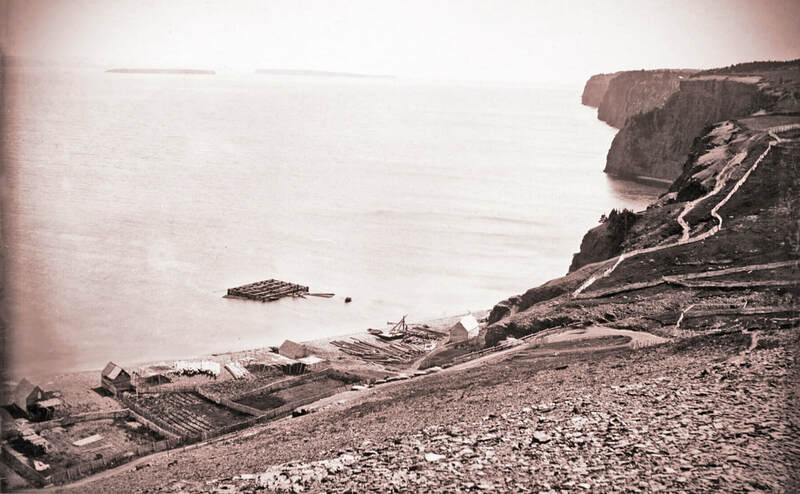 ​Here now is Part 1 of Thomas Power's memoir of growing up on a farm on Bell Island in the 1880s-90s. Below is a photo of The Beach, Bell Isle, c.1896, by the St. John's photographer, James Vey. This was Thomas A. Power's playground in his boyhood. There was no ferry terminal, just a poor excuse for a wharf, such as it was. The Beach Hill was no more than a cow path. The first ore pier had only just been built and is barely visible. Photo courtesy of A&SC, MUN Library.